Congratulations to Michael J. Davis, CPA for being elected president of the BuxMont Chapter of the Pennsylvania Society of Tax and Accounting Professionals. We would like to thank all the veterans for their service to our country and remember those who lost their lives fighting to save our way of life. Our firm is dedicated to providing timely, relevant information to assist small businesses beyond the obvious areas of accounting, tax compliance, and tax planning. VOTED BEST IN BUCKS COUNTY FOR 2012, 2011, 2010, 2009, 2008, 2005, 2004 AND 2003. In today's complex business world, it is difficult enough for the small business owner to maintain the necessary skill level in his or her chosen field of endeavor. It therefore becomes difficult for the small business owner to be able to keep up with the financial developments necessary to run his or her business. We can help your business beyond the obvious areas of accounting, tax compliance, and tax planning by interpreting all of your business needs and consulting based our firm's broad experience in similar fields. Information without interpretation is useless. In addition, your system may not be delivering the right information. We are equipped to serve in improving these conditions. Accounting services Auditing services Tax services Management consulting Computerization Project analysis Inventory control Employee benefits Estates and trusts Attend board meetings Business income tax prep Business purchases and sales Business succession planning Business valuations Compensation planning Fixed asset and depreciation records Payroll and sales tax services Personal financial estate planning Preparation of financial applications Personal income tax preparations Training and assistance for in-house bookkeeping staff. 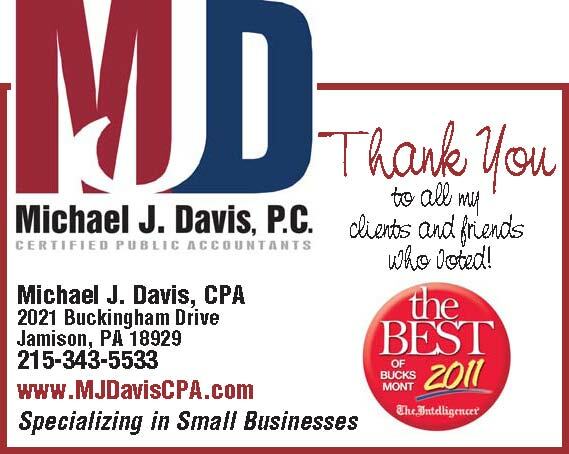 At Michael J. Davis, CPA, these are more than just the latest customer service buzzwords. They're a commitment-the guiding principles our team members follow each and every day as we work with you toward a successful future. Offer you a level of service that exceeds your expectations, whether you're looking for a copy of a single tax return or a complete audit of your business.